The French city of Laval has a population of over 51 000 people and is located in the department of Mayenne. The town was founded by fourteen smaller urban communities, united in one in 2000. 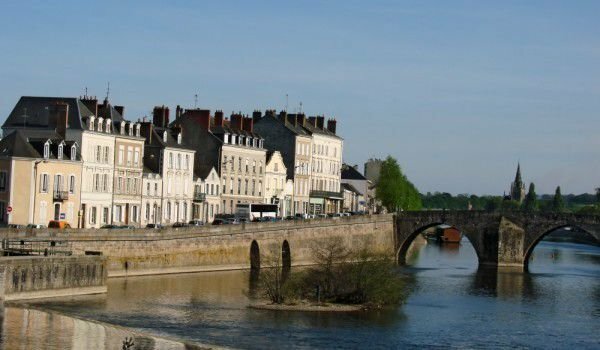 Historically, Laval was founded in the sixth century as a trading post, which was based on the banks of the river Mayenne. In town you can see an ancient castle that was built in the eleventh century to protect the city from enemy attacks. Another hallmark of the city is the Old Bridge, which crosses the river to the castle. The old part of the castle is used as a museum of art, but part of the beautiful new building was used for a courthouse. From the castle to the city center, go down the street La Grande Rue. At the foot of the castle lies the old port. For tourists it is extremely interesting and enjoyable to walk along the medieval streets. Some of the shops on the street La Grande Rue are preserved almost in the same form as shops in the Middle Ages were, which adds charm to this area of town. The city of Laval has many churches. Among them stands the Basilica of Notre Dame d'Avesnieres, which is considered the most beautiful in the whole region. It is seen from afar because of its majestic tower. In the center operates a market that is open on Thursdays and Saturdays and is located near the Palace of Justice. Since 2007 Laval already has a metro. Among the landmarks of the city stands the Museum Vieux Chateau. It is located in the heart of old town and presents the visitors with an interesting collection of historical documents that reveal the detailed particulars of the history of the city and the whole area, which today is the city Laval. The museum presents a number of artifacts found at various locations in the vicinity of the city and its territory. They give new insight into the history of the castle, which is located in the city. When you get into the museum, one feels like you are brought back in antiquity, when life was not so busy. The history of the area is presented to the visitors in an unusual way, which helps to understand it much better. In Laval is located the museum of children. This is an interesting place where visitors can see an unusual exhibition. Most museums in the country are oriented towards adults and visitors are made to follow the attitudes of older people. The museum offers children a completely different concept. It is aimed solely at children and talks about the lives of children. In the museum you can see the difference in the lives of contemporary children and the children of past centuries, which were used in various fields of industry and labor. The Museum of Science is located in a beautiful old building located in the heart of the city. In it are collections related to various developments in science. The museum offers interesting exhibits, which will be judged on merit by the representatives of different age groups. Visitors can participate in some of the experiments taking place within the museum and become part of a scientific discovery. The museum has a collection of artifacts related to research findings gathered from across the globe. The Museum of Art is for fans of the works of famous painters and sculptors. Many of them were born in the city, others came here to draw inspiration from the beautiful scenery and lifestyle of the residents of Laval. The city of Laval is home to the theater Marcellin Champagnat. It is part of the cultural heritage of the city. It put on the latest plays and classic works of famous French playwrights.